To assure the safety of life and property of the citizens of the Town of Mars Hill and the surrounding communities to the best of our abilities. 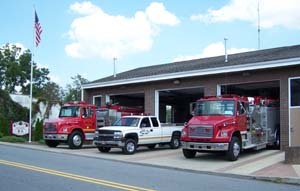 The fire department provides fire protection to both the Town of Mars Hill and the Mars Hill fire district which extends from Petersburg to Buncombe and Yancey county lines and to Beech Glenn under a special fire district tax administered by Madison County. Equipment - The department operates one Engine, a 75' Ladder Truck, 3 Pumper-Tankers, 2 Brush Trucks, one Service Truck, 2 First Responder/Multi-Purpose Vehicles, and one 4-Wheeler ATV. 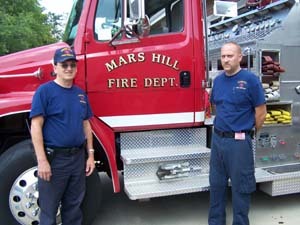 Fire Insurance Rating: Mars Hill Town Limits and those areas located within 1000' of a fire hydrant which are Class 5. Those in the Rural District within 5 road miles from the station are a Class 6. Those in the Rural District that are over 5 miles but not more that 6 miles from the station are Class 9-E. All others in the Mars Hill response District are Class 10. Burning Permits - As a convenience and assistance to the NC Forest Service, buring permits may be obtained at the Mars Hill Fire Department.